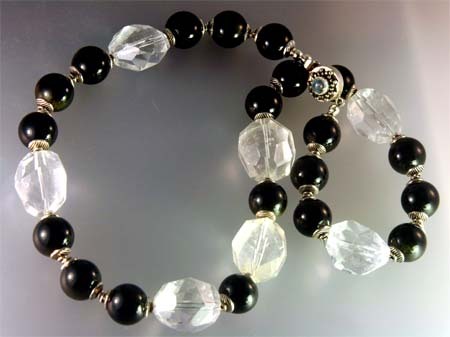 Enhance your direction and clarity of purpose with this spectacular Crystal Purpose Necklace of Gold Sheen Obsidian, Crystal Quartz and Moonstone Clasp. Every design is cleansed so that the healing properties of the gemstones will be at their fullest. Before each creation is sold, it is passed through the smoke of burning natural sage, a process known as "smudging." This cleanses and purifies the energies of the gemstones so they may bring the most benefit to the wearer.